MultiEnergy - Solutions have now come individuals and foresee institutions with 3rd the generation biomass/gas installations on the market, arranged for entirely or partially in your energy need. Biogas is a gas mixture that arises as a result of biological processes. The head components of biogas its methane and carbon dioxide. The gas arises as a result of leave (anaerobe process) paid of organic material such as manure, sewer silt, active silt or household rubbish. An example of a biogas which arises in a natural manner is marsh gas. Gasification is a thermal process where the material analyses oxygen in the presence of a small quantity. That quantity oxygen is this way chosen that the process sufficient warmth provides to remain on pace. 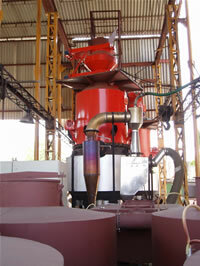 Typical temperatures at the gasification of biomass lie between 800-1000�C. gasification produce a gas that can be used to arouse energy. Biomass is energy from organic material, which said on its simplest, if detritus start rot among others methane gas are then formed which can be used to launch turns a generator set and flow to therefore arouse for several aims. Now there are also organic fuels which were obtained by pressing and treatment, the so-called bio fuels, take colza, sunflower oil, palm oil, etc., these are but say the grown fuels and which use precious agriculture ground, not only in the Netherlands but especially in the developing countries and probably cause there already misery and exploitation, in the future famine. Multienergy - Solutions only use rest material and detritus, you must think of manure, GFT, oldwood, paper, house keeping detritus etc. we have now come for individuals companies and foresee institutions arranged with 3rd the generation biomass/gas installations on the market, for entirely or partially in your energy need.